The teams were provided with 2 sets of development tyres, that sit between the current soft and super soft compounds. Ferrari: Massa’s front wing kicked up some spark as his runs over a kerb, but at least it wasn’t flapping about. Alonso has his rear wing changed ( has a slight bow to it), before he heads out again. Half an hour left Massa goes in hard and the car snaps at him, massive flatspots are caused. Alonso (with new front wing) gets on the kerb like Massa and the car snaps at the 5/6 chicane. Purposely missing a corner, Alonso use the run off to bypass suggesting a problem with the development parts. Force India: Sutil just about manages to catch his car as he ran wide into the pit straight. Both drivers are fighting their car around the track. Hispania: Unremarkable session and Liuzzi finishes ahead of Ricciardo. Lotus: Kovalainen was on track but soon returned and exited his car as a pit crew member handles an extinguisher. The focus was surrounding the rear left, but turns out to have been a reaction to a smoke caused by heat reflective paint, no drama. Trulli slips and slides about through the 5/6 chicane. 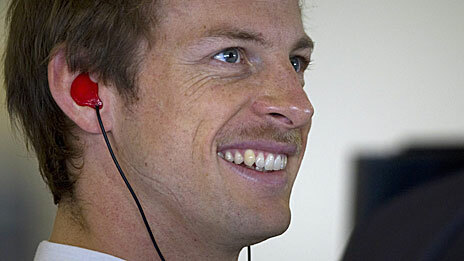 McLaren: Button is getting involved in Movember too. Hamilton sets his first time and holds onto the top spot for some time. 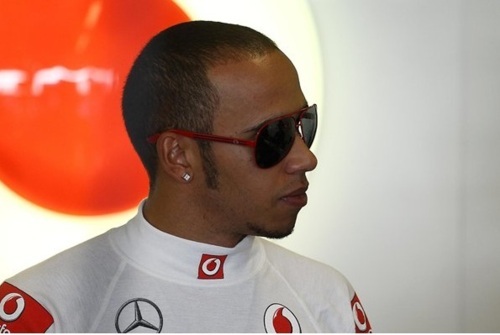 Hamilton also had his front wing changes between stints on track. Button gets into the groove to go faster than RB 45 mins. They keep their hold over the top of the timesheets until the end. Mercedes: Schumacher enjoys the smooth run off area. Red Bull: A quiet session for the team as they put in the laps, 48 minutes left and Vettel takes the top spot before Webber finds a tenth with 46 minutes left. Renault: Grosjean is in for Senna and sets the first time of the weekend. The team are concerned that the track will not suit the car, with a preference for fast corners. Grosjean makes his track time work for him and ends the session inside the top ten. Petrov made a quick exit from his car in the pitlane as the car begins to emit smoke, ‘burning carbon fibre’ smell is mentioned. Sauber: It is revealed the team is getting invovled in Movember too. Kobayashi’s car is up on its jacks in the pits with a drive chain issue, gearbox issue (wasn’t changed). Toro Rosso: Vernrge in for Buemi and is first out of the pits. Alguersuari gets a rear suspension change with 20 minutes left. Vernge, with 5 minutes left creeps ahead of his temporary team mate. Williams: Both rear wings are covered in flo-vis before heading out. Barrichello has a mechanical issue (oil pressure) at turn 11 and stops at turn 13 with an hour to go. Maldonado to be penalised 10 grid places for using a 9th engine. Maldonado hit a green bollard and cracked his front wing. News from Barrichello’s garage, ‘catastrophic failure’ and a new engine is required. Virgin: Wickens is in for d’Ambrosio. Glock ends his session with a spin at turn 1. Ferrari: Massa hit some debris in FP1 according to Ferrari. The Ferrari flutter is back as a slo-mo replay of Massa’s car illustrates, flexing so much it send sparks up (it was changed with an hour to go). Alonso got his car back under control to go faster 15 minutes in, but as the session continues he’s fighting the car. Alonso copies Vettel and collides with the barriers with 22 minutes left, carrying too much speed into turn 1. Force India: Overall good pace for the pair, but di Resta is still getting to gribs as he lags behind. Hispania: Liuzzi is out of the car for a chat with his engineer with 50 minutes left. Unremarkable session. Lotus: Early moment for Kovalainen but he saves it. McLaren: Quiet early half to the session for both drivers, but with 40 minutes left both drivers reclaim P1 & 2. Hamilton as a lock up after reattaching DRS. It is McLaren that have got everything right today with other making mistakes. Mercedes: Schumacher still using the run offs throughout the session to test the limits of his car. Red Bull: Keen to take the power both drivers take the top spots early, but have to relinquish it to Alonso. Webber has a spin after passing under the hotel, and returns to the pits immediately. 45 minutes left and front wings are adjusted (2 turns for Webber, 1 for Vettel). Snap oversteer for Vettel at turn 1 with 36 minutes left, and gets wedged in the safety barriers which deploys the yellow flags. Vettel gets back out before the clock runs out. Renault: Senna is back in the car. Petrov’s issue in FP1 was a failure of the power unit (supplied by McLaren) which allowed some fuel to enter the exhaust. Sauber: The pair are hovering around the points watershed. Toro Rosso: Buemi is back in the car and after Vettel’s bump with the barrier has a scare into the same corner but uses the run off to correct himself. Williams: Barrichello manages to get out on track in time with his eighth engine. Virgin: D’Ambrosio is back in the car.